Steven Gerrard is a member of that increasingly rare breed-in these days of multi-million pound global transfers-a one-club man. Although at one point he was believed to be close to joining Chelsea, he has so far played out his barnstorming career at the heart of the midfield for Liverpool and England. Born in 1980, Gerrard joined Liverpool as a schoolboy in 1997 after being tracked by Liverpool scouts since the age of fourteen, although he also had trials for archenemies Manchester United. But Liverpool it was, and after a starring role in the youth team, Gerrard was awarded a professional contract in 1998 and made his premiership debut in the same season. He was slow to establish himself in the Liverpool first team, but that was more down to manager Gerard Houllier’s desire to protect the young midfielder, who was having fitness problems related to growth spurts. Eighteen months later England manager Kevin Keegan picked Gerrard for his first England appearance in a friendly against the Ukraine at Wembley, and impressed enough to make the squad for to the European Championship in France in 2000. In a largely unsuccessful campaign, Gerrard’s only appearance was as a substitute in the group stage defeat of Germany, and he didn’t get a chance to establish himself in the squad until the spring of 2001. This meant that he missed the match where Germany took their revenge, when his Liverpool team-mate Dietmarr Hamaan scored the only goal in the last ever game at the old Wembley. But he was in place for the return 2002 World Cup qualifier at the Munich Olympiastadion three months later, with most people believing England’s chances of qualification were over. Sven-Goran Eriksson had taken over from Kevin Keegan after the latter had resigned following the Wembley debacle. After Germany scored an early goal, Michael Owen equalised a few minutes later then just before half-time, a Beckham free kick out near the right-hand corner flag was charged down. Beckham re-gathered and floated a left foot cross to the rear of the penalty area, where Rio Ferdinand cushion-headed the ball back to a waiting Gerrard. He chested the ball down, waited for the bounce, then volleyed it right-footed 30 yards through the crowded penalty area to dip inside the foot of Oliver Kahn’s right-hand post. The match ended in an epic 5-1 win and England’s belief returned, taking them through to the finals in Japan and Korea. 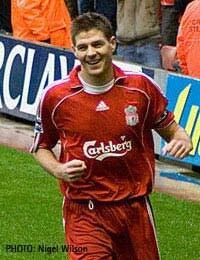 Gerrard’s stunning début England goal announced him to the world, and was voted the third best ever England goal, in a 2005 poll of fans conducted by Sky Television, but the Liverpool fans had seen many like it already. He is a strong midfielder, not perhaps a ball juggler but still able to go past defenders with his force and determination, with a vicious shot in both feet. Now fully grown, as he was the same height as Michael Owen when he made his Liverpool début, at 6’ 2” he has good heading skills too. Although the young England team went to the World Cup and acquitted themselves well, losing to Brazil in a quarterfinal, Gerrard did not go. Struggling with a recurring groin problem that in the end took four operations to put right, he had to withdraw from the squad. His first chance to show what he could do on a big stage was the 2004 European Cup in Portugal. England had qualified strongly with six wins, two draws and no losses, although it was not a particularly strong qualifying group. In the first group match against France Gerrard had an excellent game but four minutes into injury time, with France having scored an equaliser on 90 minutes, his loose back pass led to David James bringing Thierry Henry down and Zinedin Zidane slotted the penalty home to win at the death. England recovered to beat Switzerland and then Croatia, with Gerrard playing well in both matches, which incidentally introduced the world to the young Wayne Rooney. Gerrard scored against Switzerland, a delightful close-quarter chip over the keeper from a Neville square ball. In the agonising quarter-final against Portugal, England went 1-0 up with an Owen goal in the opening minutes and then hung on grimly until the hosts finally equalised in the 82nd minute, shortly after Gerrard had been replaced by Owen Hargreaves. Both teams scored in extra time so penalties were the order of the day, and England went out. The World Cup of 2006 was no better, with the same result, defeat by Portugal on penalties after some lacklustre displays from the ‘golden generation’, by now at their peak but seemingly unable to gel. Gerrard scored two goals in the group stages, one each against Trinidad & Tobago and Sweden, but his penalty against Portugal was saved. Much criticism was levelled at a team who admitted under-performing, with focus on the by now incredible salaries being enjoyed in the premiership, and the extra-curricular activities such as autobiographies and the accoutrement of celebrity lifestyles. The Gerrard-Lampard problem showed itself as England lurched uncertainly and eventually unsuccessfully through the qualification stages for the European Championships in 2008. At various stages throughout the campaign, injuries forced McClaren to do without either of them and he picked holding midfielders such as Owen Hargreaves and Michael Carrick to play with either Lampard or Gerrard. Toward the end of the qualification campaign, with Lampard injured, the combination of Gareth Barry with Gerrard worked exceedingly well. But for reasons best known to himself when it came to the crunch match against Croatia, McClaren stuck with Barry but could not resist putting the fit-again Lampard back on next to Gerrard. Consequently neither Gerrard nor Lampard could take control of the game. One can only guess what might have happened if he had had the guts to stick with the Barry-Gerrard partnership that had worked so well in the previous games. Now the problem has been passed to another manager, Fabio Capello. Although there are some rumblings of discontent, no-one can argue against a superb 2010 World Cup qualification campaign. This saw Lampard and Gerrard at the heart of an England side that lost only one match throughout the whole campaign, and that was after they had qualified. Gerrard may yet be given the opportunity in South Africa to repeat for the country what he does for his club every week, which is to take charge and excel.